Annette Pugh paints the places she visited as a child: the pleasure gardens of Somerset; the holiday camps and coastline of Devon; the English Riviera. Encapsulating the typical haunts of the British working class, she creates both a personal and collective memory, invoking in many viewers the notion that, “I went somewhere like that”. She explains that she likes the fact that her paintings and large-scale drawings, defined by rich foliage, palm trees and light, are “not what they first appear to be”. 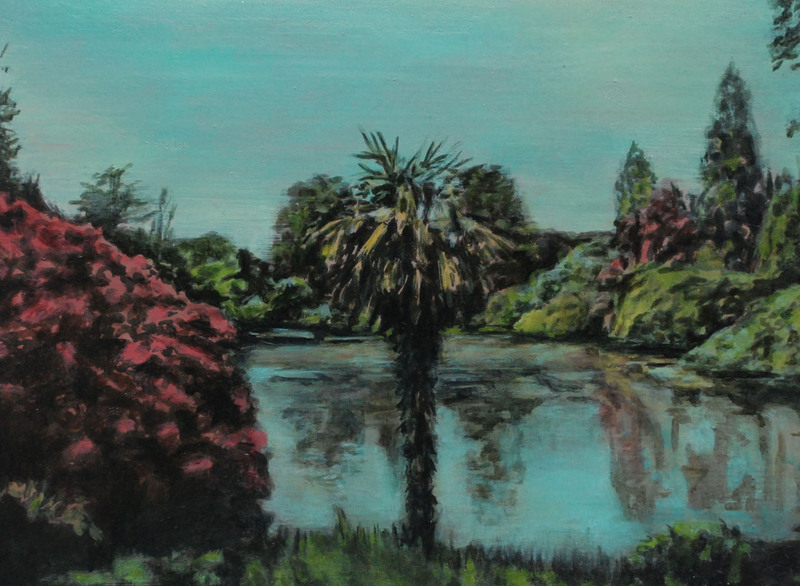 Ostensibly exotic, her landscapes are, in fact, British places that have been “a little bit forgotten”. Annette Pugh is one of a number of leading contemporary artists who assimilate archival material into their practice, projecting and up-scaling found photographs into her paintings and ink drawings. Whilst she uses some personal family archives, most are often those that she discovers in flea markets or charity shops. Of particular interest to her is amateur photography from the 1950s and 1960s. The figures in works such as ‘Somewhere I Have Never Travelled’ could originate from any number of working class family albums from this period and represent a past era. “I do change the found imagery quite a lot…I like lone women, I think they are fascinating”. The artist’s interest in photography comes, in part, from her MA in Art and Design Histories, during which she examined the use of the digital in fine art, and particularly painting. Pugh cleverly alludes to and incorporates the nostalgic quality of historic photographs, by framing works such as ‘The Muses ‘with a blurred, dissipating vignette. There is also a digital quality to the impressionistic patterns of the foliage in ‘Indian Summer’, which were painstakingly painted with a fine brush in just two sittings. In his 2004 essay, ‘The Archival Impulse’, art historian Hal Foster defined archival art as a genre that makes “historical information, often lost or displaced, physically present”. However, Annette Pugh also investigates the point at which the photograph becomes “more than just a copy”, deliberately displacing it within her mystical settings. Annette Pugh also frequently changes the found archive imagery which she uses. Often, she will separate women from the group compositions of the original image, isolating them in paintings such as ‘In the Pale Blue Light’, ‘Seated’ and ‘Here Where The Roses Bloom’. There is a real romanticism to these paintings, recalling Daphne Du Maurier’s gothic tales, in which everything is not as it seems. As in Du Maurier’s fiction, which Pugh enjoys reading, the female characters find themselves in places infused with memories, atmosphere and mystery. There is also an episodic quality to these works, which capture what the artist terms “uncertain moments”, and hint at narratives beyond the picture plane. “I investigate the point at which, and how, an image becomes more than just a copy”. Annette Pugh’s paintings tell of a journey through and into place, as well as a journey into memory. Her images invoke the viewer to question what makes memory, particularly in a post-photographic world. The artist shows how subjective recollection is entangled with visual imagery, of both the camera and the artist’s hand. This emotive series also shows memory to be both personal and universal. As the artist so eloquently says, these images are about capturing and constructing “a memory or moments that feel familiar to an audience, rather than being anyone’s particular history”. Annette Pugh’s exhibition ‘Somewhere Never Travelled’ is on show at Reuben Colley Fine Art in Birmingham from 6th February – 4th March 2017. She is part of Birmingham Artspace, an artists’ collective working from studios in an industrial building near the centre of Birmingham. The group comprises of the following established artists working in diverse media: Angela Maloney, Angelina May Davis, Annette Pugh, Carey Hendron, Frank Clarke, Graham Chorlton, James Byrne, Ruth Spencer, Sadie Christian. Annette is also an Associate Member of the RBSA Gallery in Birmingham. She is especially committed to helping the gallery deliver charitable work, particularly working with schools. Most recently she has delivered art workshops in schools based around portraiture to explore issues of appearance with a view to helping encourage change in public attitudes towards disfigurement. This article was published by Grapevine Birmingham, for which Ruth writes about the arts scene in Birmingham.